Looking for something to do this weekend? We compiled a list of some of the fun things going on – there’s something for everyone! Friday Extra Concert Series – Outdoor concert at Tampa’s Lowry Park Zoo’s Bandshell featuring Rayzilla’s Dreamboats opening for Acme Jazz Garage. The free event is presented by the City of Tampa. 7 p.m. at 7525 North Blvd., Tampa. 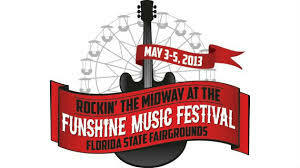 Funshine Music Festival (Friday-Sunday) – An excellent combination of fun and music! This weekend music festival also has thrilling rides and features bands from every genre such as Train, REO Speedwagon, Styx, The Wallflowers, Gary Allen and more. See the full list or performances here. Florida State Fairgrounds, 4800 U.S. 301, Tampa. Ticket prices vary depending on seating. Tampa Firefighters Pediatric Burn Survivor Run – Chip-timed 5K and one-mile street run that starts and ends at the Tampa Firefighter’s Museum and Fire Rescue Headquarters at 720 Zach St., Tampa. Every runner gets an ice cream at the finish line. The 5K is $25 and the one-mile is $15. The race starts at 8 a.m and benefits Camp Hopetake, the Children’s Burn Survivor Group. May the Fourth be with You Party – May the fourth be with you on Star Wars Day at the Bricks of Ybor this Saturday. Starting at 5 p.m., wear your star wars costume, pose with cutouts, and get your face painted like Yoda. 1327 E. 7th Ave., Tampa. Make your own Mother’s Day gift – Make the mother in your life a unique Mother’s Day gift at Phoenix Glass Studio and Gallery. See glass blowing demonstrations and make a glass flower, ornament, or paperweight for $50. 10 a.m. – 5 p.m., 811 E. Knollwood St., Tampa. Sunday – Celebrate Cinco de Mayo! Green Lemon (Saturday-Sunday) – Celebrate Cinco de Mayo all weekend at the Green Lemon, from the mustache contest on Saturday to DJs all weekend. No cover charge, 915 S. Howard Ave., Tampa. Cinco de Drinko at the Lodge – Wear your sombrero for extra drink specials and celebrate the day with a Corona. No cover charge, 516 S. Howard Ave., Tampa. Seminole Hard Rock Cinco de Mayo Party – Party all day with $5 blackjack, food and beverage specials in all bars and restaurants, including crunchy tacos and cheese quesadillas. Cold margaritas and Corona Lights are $2.50 from 4 p.m. until 4 a.m. Fiesta music will be played by The Current from 10 p.m. – 1 a.m. 5223 North Orient Rd., Tampa. Vallartas (Saturday-Sunday): The two-day party starts at 4 p.m. on Saturday and continues through 10 p.m. on Sunday night with a DJ and two-for-one beer and margarita happy hour from 2-7 p.m. 13731 N Dale Mabry Hwy., Tampa.